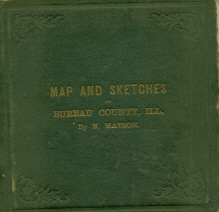 Index to MAP & SKETCHES OF BUREAU CO., ILL., by N. MATSON 1867. Map of Bureau County, Illinois, with Sketches of its Early Settlement, by N. Matson, published by the author. Chicago: George H. Fergus, Book and Job Printer, 1867.